On Friday 15th November 2013 I co-presented my first participatory approaches workshop session at the AUA Yorkshire & North East conference in York with my colleague Janette. Our journey to this conference began in April when Janette was approached by the AUA and invited to submit a proposal to deliver a session around Jisc online resources. As I’m studying on the AUA PG Cert I am always looking for opportunities to develop my skills so when Janette asked if I wanted to co-present the session, I was keen to get involved. We decided that in addition to highlighting our online resources this session was an opportunity to use participatory approaches. We put a lot of time and effort into planning the session, we even produced our own timelines to tell the story of the planning process. A week before the conference we had the chance to run through the session with our colleagues which was a valuable experience as they noted a number of issues in relation to the structure and flow of the session. We needed a thread that delegates could easily follow so we decided to create a scenario that delegates could relate to and build in participatory exercises giving them the opportunity to use the techniques. It was important that we listened to feedback from colleagues who themselves had delivered a participatory workshop and were talking from experience. Aware that the clock was ticking we spent a day reworking the session, the feedback from colleagues allowed us to identify a way forward and as a result we felt much happier about the session. The day of the conference arrived we’d been informed by the AUA to expect 40 delegates in our session, initially we were a bit daunted by this but on the plus side having more delegates created a better chance for discussion. We arrived at the room to find that it hadn’t been set up as we requested, in a panic we began moving furniture. Once the session began, the delegates really engaged with the activities and there was a lot of energy in the room. There was a lot of discussion going on around the exercises so plenty of opportunities to highlight to delegates how we and others from the sector had used these techniques. In addition to showcasing a number of practical techniques for delegates to take away, we provided them with a link to a Google Doc containing information on our online resources as well as links to examples of where these participatory approaches have been used in the sector. Planning and delivering this session was challenging at times – I felt outside of my comfort zone – but it was a good experience and one that I would like to build on in the future! 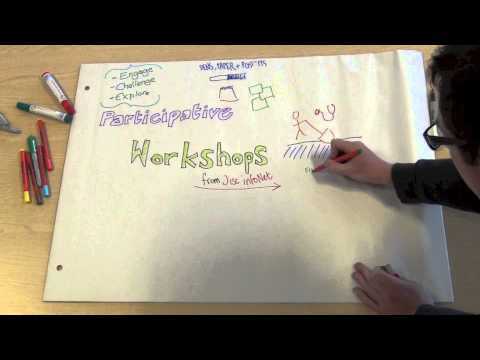 Posted by Gemma Elliott on 19 November, 2013 in Events and tagged participatory approaches. 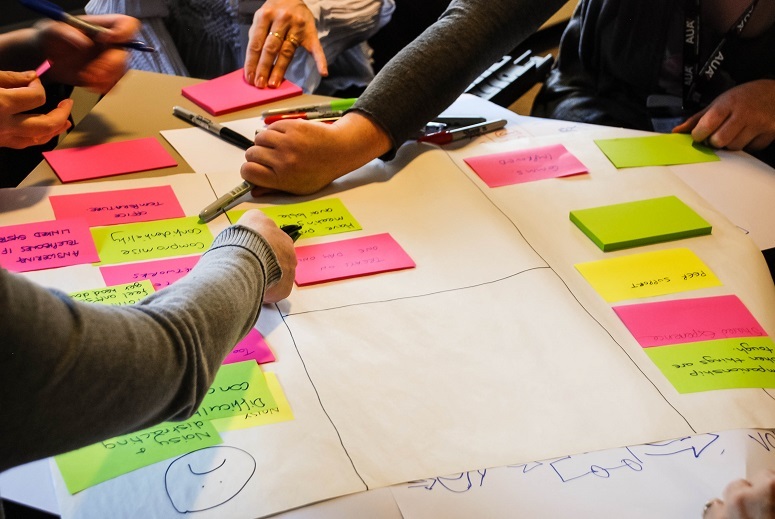 Recently at Jisc infoNet, we’ve been working on an update to the events section of the website. This follows on from our revamps to the topics section as well as the publication of new resources and tools. Like many sections of the website, updating events required the team to think about our offering, the content and promotional aspects. We kicked off with an events taskforce meeting to bring together key members of the team to discuss what we wanted to achieve and where the focus should be. This wasn’t just about the website, but about delivery of events and about maximising our offer through Regional Support Centres (RSCs). As you might have read on our Spotlight blog, we’ve taken a new approach to workshops that stems from our journey into participatory techniques. It’s now fully embedded within our culture and a great way of making workshops interactive and flexible. We wanted to find a way to reflect this within the website and so we looked at creating a video to help promote the new offer. We’ve created lots of videos before – check out our YouTube channel – but this time, rather than being related to a particular resource, we needed it to be promotional. We needed something that showcased the techniques and showed how engaging the workshops are. After generating and drawing some great ideas, we put them together into one giant rich picture. We wanted the picture to tell the story, so we set up the camera and re-created it whilst recording. Speeded up to 8x normal speed, we had a fantastic timelapse effect. Interspersed with photographs from recent workshops, we think it really shows the breadth of our offering to the sector in a clear and visual way. You can see our video embedded below or on YouTube. 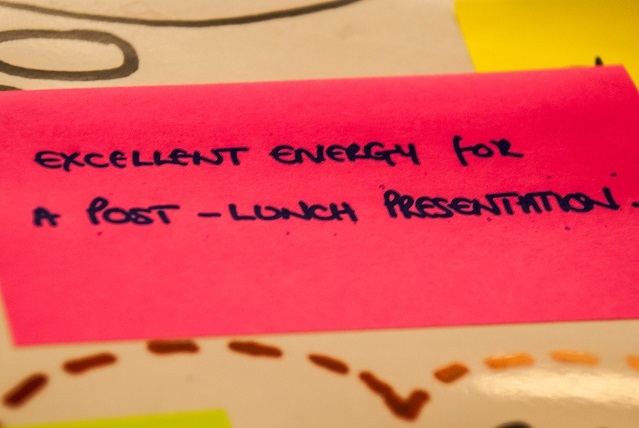 The process helped the team to clarify our workshop offer and generated a range of key messages that we could then use to develop the website – giving the user a much better idea of what they could expect. Over the last 18 months, we’ve been engaging with our customers to help solve their problems, and facilitated workshops have really helped in exploring and finding solutions. We think that organisations reap great benefits from these types of events, so if you want to find out more take a look at the website, or get in touch via email or through Twitter. Posted by JISC infoNet on 17 October, 2013 in Events and tagged communications, website. Developing a social media strategy? If you’re looking to develop a social media strategy let me just stop you right there. Don’t. Start off by revisiting what it is your organisation does; look at its vision, mission and strategy. Once you’re clear on that and the way in which your department/faculty/service supports that strategy, only then should you really start to consider a communications strategy. Social media is a method of communication and quite frankly won’t be used by your whole audience. It does have its advantages over traditional media but they’re to be ignored at your own peril. This post outlines some of my learning from a recent workshop led by Tracy Playle (Pickle Jar Communications) and my experience of developing (ongoing) Jisc infoNet’s communications strategy. We already had this ‘kind of’ defined but perhaps not as clearly as this. From here we have started to develop a more comprehensive list of indicators and targets which we can use to assess how well we’re doing in each of the areas. There is still some work to do on these, however we can now begin to clearly articulate where different communication channels can help us to achieve our targets. Reassuringly, this aligned very closely to the advice given in the workshop. I think some of them could be grouped together and I’d probably add in collaboration tools but other than that it’s a pretty comprehensive list. I think focusing on type as opposed to a tool is quite important as the focus should be around practice. Tools come and go and we should be wary of that. Focusing on practice will put us in a good position going forward. One of the biggest lessons that came out of the Pickle Jar Communications workshop for me was the idea of audience profiling. As a team, we’ve developed a fantastic stakeholder analysis which provides a whole raft of information on key stakeholders and their communications channels however we’ve never really drilled down into the behaviour of specific individuals eg a user’s journey when booking a workshop. It kind of ties in with the idea of service design in my mind. In mapping the user’s journey you can gain a clearer understanding of the key interactions and begin to identify whether they can be introduced earlier in the process through other means – perhaps a YouTube video of a previous consumer outlining what they got out of the event up front on the website. For me there are two sides to communications. On the one hand you’re focusing on identity and having a presence in the outside world. On the other hand it’s about setting up specific campaigns to help support your organisational objectives. On the train home from the workshop my colleague and I began to brainstorm some ideas. Will we get the go-ahead? Keep an eye out for the next instalment of our journey into the complex world of marketing and communications. Posted by Andrew Stewart on 14 October, 2013 in Communication and tagged communications, indicators, SMART, strategy. A while back I wrote a post detailing our approach to communicating service resources. In a nutshell it focuses on the launch and dissemination of our online resources. The process involves developing a launch and dissemination plan and typically involves promoting a resource through social media, email, existing networks, and our service blog. In this post I’ll be reflecting on the data we’ve collected since initially launching the e-safety infoKit and having used the approach for a range of other resources. Tapping into other networks seems to generate the most traffic. The ALT News Digest resulted in the most visits. The RSCs e-bulletin was a close second. People do read our blog! It generated the third highest number of visits and they viewed the resource longer than any others. Twitter did not generate the most traffic. In fact it was 6th out of 8 in terms of the comms channels we used. However, the average visit duration was second only to traffic from our blog. Visitors from twitter were also much more likely to view other pages during their visit. Our mailing list didn’t seem very effective in engaging people. It generated a fair amount of traffic to the infoKit but the average visit duration was the second lowest. 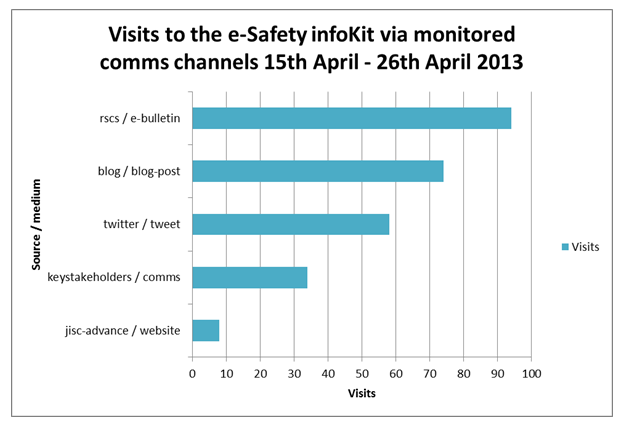 Overall, the e-safety infoKit has had 3,934 “pageviews” three months since its launch. We know for certain 2,321 of those “pageviews” came from an academic network. The bounce rate is 14.66% less than the site average and the exit rate is 5.51% lower than the site average. The table below provides a summary of data relating to our planned communication campaigns used for the e-safety infoKit. Twitter has generated the most traffic to our website excluding website referrals (typically where we’ve transferred a resource to our site from a wiki). It’s also the easiest channel to use. Building on existing networks is vital. We assess which stakeholders might be interested in a particular resource and email them to let them know it’s been updated/launched. Where possible we try to build on contacts we already have. Where this isn’t possible we try to foster new relationships. People that read our blog appear to be the most engaged. The average duration of their visit and pages viewed per visit are the highest. That said we attract the least amount of new visits through our blog so we’re probably preaching to the converted. This of course does vary depending on the topic we’re working on and the audience we’re trying to promote it to. That’s why it’s important to think about the plan upfront as mentioned earlier. Since the initial article we’ve set up a marketing and communications working group and we’ve also developed a draft communications strategy. Our focus early on was around social media but we realised it needed to be much broader, focusing on communication more generally. As a starting point we went back to basics and discussed what it is our service does, reflecting on our core business functions which comprise things like: managing projects and programmes; managing the service; producing materials; organising service events; and so on. We then spoke about success criteria relating to these business functions and the way in which marketing and communications could help us to achieve them. This resulted in a number of recommendations which we shared with the wider team for discussion. Once that’s been agreed we hope to make a lot of progress in this area. Generally speaking we are a lot more comfortable with communications from an organisational perspective and are beginning to develop clear processes to support key business functions. As individuals our team is very comfortable using social media, however, we haven’t made the most of it from an organisational perspective. As it stands we receive a very low amount of our website traffic from social media referrals (Aug 12 – Jul 13). We are very proud of our resources and we want people to know about them and we’d like to use social media to increase awareness of what our service offers – online guidance (infoKits, tools, topics), facilitation workshops, staff development workshops, hosting events, public speaking and managing projects and programmes. The risk is that we begin to annoy people by bombarding them with updates and so we’ll be working hard to ensure our communications are relevant and of value to anyone listening. Posted by Andrew Stewart on 3 September, 2013 in Communication and tagged dissemination, metrics, social media, strategy. Over the past few weeks our team have been thinking through how we can communicate our resources more effectively through various channels. The thing is we don’t really have a handle on what works best at the moment so to begin with we’ve settled on using those channels which are already well established across the service and gathering some data on their effectiveness. Those channels comprise of: our mailing list; twitter; and our service blog. On top of this a decision is made as to whether any changes are required for the front of our website and we email relevant stakeholder organisations to inform them of new/updated resources. This level of detail is something new to our planning and as such we’ve been working very hard in trying to adopt it for some of our newest resources i.e. the e-Safety infoKit, online learning topic and MOOCs topic. One of the big differences is our approach to monitoring how well the different communication channels work. To do this we’re using Google’s Custom Campaigns. At the time of writing the e-Safety infoKit has been live for 11 days and has had 716 pageviews. From the channels we’ve communicated links through we’ve had 268 visits (I need to work out how best to match this back to content statistics e.g. pageviews). The graph below highlights which channels are driving traffic to our site. Bear in mind this is still early days and not every communications channel posted messages on the same day — we log these using annotations within Google Analytics. We aim to review the launch of the e-Safety infoKit a month after its launch to think through some of the implications of the data we have but it could be that we don’t have a full understanding until six months down the line when we can also match the e-Safety infoKit data with others. I am surprised that the link from our blog post has resulted in more traffic than twitter. There’s still lots to do. This process focuses on the dissemination and launch of products. We still want to think more strategically about the types of messages we send out more generally from our communications channels. This will help to inform and educate the team how best to use the various tools we have in place. If you have any advice or guidance that you’d like to share with us please do so in the comments below or contact the team directly. We’d love to hear from you. Posted by Andrew Stewart on 3 May, 2013 in Communication and tagged channels, communications, monitoring, process, template. One of the underlying principles we’ve adopted in managing content on the website is that of ‘publish early, publish often’. This is adopted from agile methods commonly used for software development and project management. Essentially, this approach allows us to publish our resources as soon as they are ready with the main aim of receiving feedback more quickly and helping us to improve resources more easily. You might have noticed that a number of our resources are currently marked as ‘under development’. This doesn’t necessarily mean that they are coming soon and are currently being developed; it actually lets people know that they aren’t the finished product, just an early release or a ‘work in progress’. This approach has helped us to reduce risks, overheads and bottlenecks within the production process and gives us more time to adapt the resource within the lifetime of a given project or programme. It allows for feedback and iteration all aimed at making the resources better tailored to the needs of the sector. With our recent infoKit releases, adopting this process has allowed us to explore different ways of gathering feedback. For example, with the Business intelligence infoKit, we’ve launched a survey requesting feedback from partner organisations with an interest in the subject. Another approach we adopted was for Relationship management, in that by releasing the resource early, the authors were able to see how the infoKit looked on the website as opposed to the offline draft, and then iterate on the content and structure as required. At all times, the resources were live on the site and publicly available to anyone. Recent resources on e-safety and virtual research environments are following the same approach. The principles of getting feedback and publishing early and often are something we want to build on with a view to making our content more open to meet the needs of our users and allow them to shape the content at an early stage. Posted by David Cornforth on 3 April, 2013 in Website and tagged content strategy, publishing, website. The environment in which you operate, whether that’s as an organisation or an individual, is changing. No matter what sector you’re from, what level in an organisation you work at, or how successful your organisation is, you simply can’t escape it. You can, however, approach change proactively, or as ‘The SUMO Guy’ summarises, “Carpe Diem” (seize the day). At Jisc, we’re constantly grappling with the concept of change. It’s inherent in implementing/adopting technology. Ultimately it’s about people and that’s certainly the focus of our advice in trying to manage change. We focus less on strategies for individuals dealing/coping with change which is why a recent free SUMO workshop, taking place nearby, caught our attention. Posted by Andrew Stewart on 22 March, 2013 in Events and tagged change management, sumo. Here at Jisc infoNet we’re always striving to improve our data visualisation design. It’s something that very much came to the forefront of our consciousness a couple of years ago. We received feedback on the quality of the data visualisations we had been using to report on the annual Information Legislation and Management Survey and realised that we needed to reconsider and update our approach and make improvements. My colleague Teresa Tocewicz blogged about the experience and the steps taken to improve things, and we’ve just published the results of the 2012 Survey – complete with newer, shinier, and hopefully more useful, data visualisations. On a related note, we will shortly be revamping our Business Intelligence infoKit to accommodate the experiences of 11 Jisc-funded projects, many of which addressed various aspects of visualisation. We are also actively considering creating a Flickr resource of examples of visualisation to go alongside this and will be encouraging submissions from the sector to add to it – so watch this space! 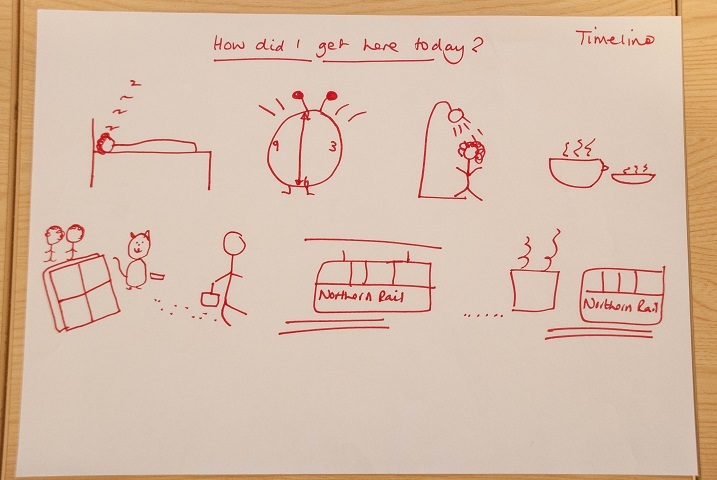 Last week I was lucky enough to attend a half day session on Data Visualisation that was a continuation of an event called Dashboarding for Peak University Performance held at East Midlands Conference Centre at the University of Nottingham. The session was led by Andy Kirk, a Data Visualisation Architect. Andy led participants through an entertaining and engaging session that was crammed full of interesting examples of good practice in data visualisation design. There was also some discussion around, and examples of, not so good practice too. There is a wide range of sources of advice and information available on the subject; many of which were touched on during the session. Slideshare collection of Andy Kirk of Visualising Data’s presentations on the subject. http://www.chrisjordan.com/gallery/rtn2/#gyre2 – Running the Numbers II: Portraits of global mass culture by Chris Jordan. This is a fascinating example of something that at first looks like something very familiar (a painting by Van Gogh) but actually when you look closer (click on it) it’s something completely different… (it actually ‘Depicts 50,000 cigarette lighters, equal to the estimated number of pieces of floating plastic in every square mile in the world’s oceans’). Posted by Janette Hillicks on 7 March, 2013 in visualisation and tagged bi, business intelligence, data visualisation, information management. You can’t make assumptions about how people will access your content; the device and platform they use, the context of use, the task they’re actually completing. You have to make sure your content is available everywhere, so you can service the increasing diversity of how people access it. Trying to embrace this flexibility has been one of our biggest challenges and has meant we’ve had to take a new look at our processes, workflows and strategies; all with the goal of making our content as future-friendly as possible. This isn’t just about making our website work on a mobile, it’s about making our content as accessible and structured as possible, and about getting it ready for a future of unpredictability and complexity. The biggest challenges we faced as a team was not design- or development-related, but all around content. We suffered from a lack of consistency and organisation, with content grouped together in structures that were sometimes far from clear. Bottlenecks within our production workflows and a content management system that was fragmented all contributed to a lack of a clear content strategy. An opportunity to improve on that became one of the defining principles of this process, one that is still continuing and doesn’t just end with a new website. Taking time to examine and evaluate your content is one of the best bits of advice we can give. If you take the time to put the structure in place, content creation becomes so much easier. We took it as an opportunity to rethink our processes and workflows for how we produce content. As we’ve outlined previously we took a mix and match approach to align our content to its most appropriate technology. We took a product-based approach to the core website that meant every resource is now grouped together by content-type. We introduced topics, created a case study repository, and moved our tools and templates into Google Drive. It’s helped us to prioritise content – having our key resources on our core website and having supplementary content hosted somewhere that best suits their purpose. Our CMS (WordPress) was carefully considered so that we could not only manage content, but customise it around content-types and taxonomies to make our content meaningful to our end-users. Discussing this last week within the team, we talked about embracing constraints and making our content more consistent. This wasn’t just about overall consistency but was at a micro-level as well; in terms of navigation, titling, meta data, images, sections, asides and quotes. This process is ongoing and will develop as we react to the ever-changing nature of the web. However, by taking the time to think about it now, we’ve put a roadmap in place for producing content that’s flexible and focused on the long-term. Technology will change. Standards will evolve. But the need for understanding our content—its purpose, meaning, structure, relationships, and value—will remain. When we can embrace this thinking, we will unshackle our content—confident it will live on, heart intact, as it travels into the great future unknown. Start thinking about your content strategy, your workflows and your processes to ensure your content is ready to embrace this challenge. Posted by David Cornforth on 26 February, 2013 in Website and tagged content strategy, mobile.